The Quebec newspaper La Presse is reporting in an interview with Canadian road pro Antoine Duchesne that he is joining Team Europcar, the French Pro Continental squad that has applied for a WorldTour licence for 2014. La Presse quotes Duchesne as saying, "I have a verbal agreement with the team because it has applied for a World Tour license next year and is still awaiting confirmation, but [the Team] has given me permission announce it. Once the license has been obtained, I will sign my contract." Duchesne is finishing his final season in the Under-23 category, and has been racing on the Bontrager squad. He is the national Under-23 road champion, and was the only rider to represent Canada in the category at the world championships road race this year, where he was 46th. 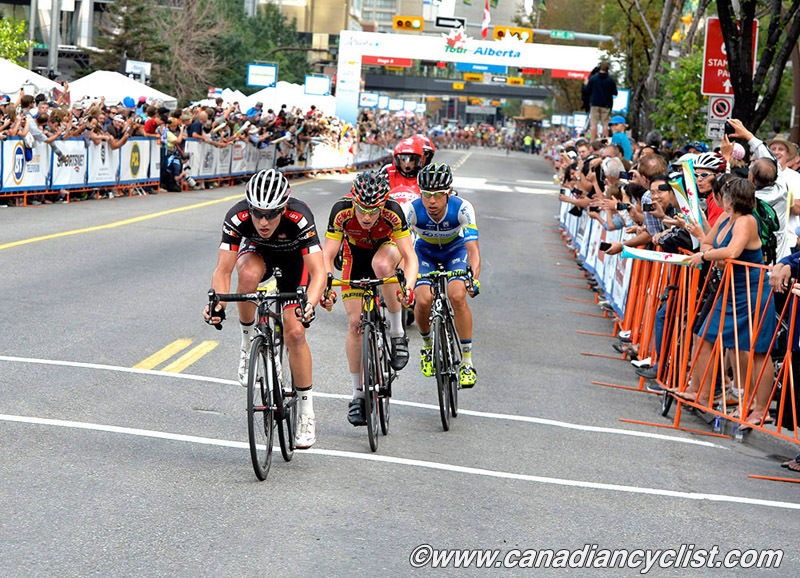 Before the Worlds, he was in a breakaway on Stage 5 of the Tour of Alberta, finishing fifth. Duchesne says the team first approached him during the ProTour [we assume Quebec and Montreal], and that Louis Garneau assisted. At this time he does not know his schedule, since the team is waiting to find out if they will receive a WorldTour licence. He will join the team in Spain for a training camp in December and move to Europe shortly after that.